Organics Studio has become very popular this year with it's monster sheeners, Nitrogen and Walden, so when I found out Tyler (the owner/creator) had released another new ink, I had to give it a try. 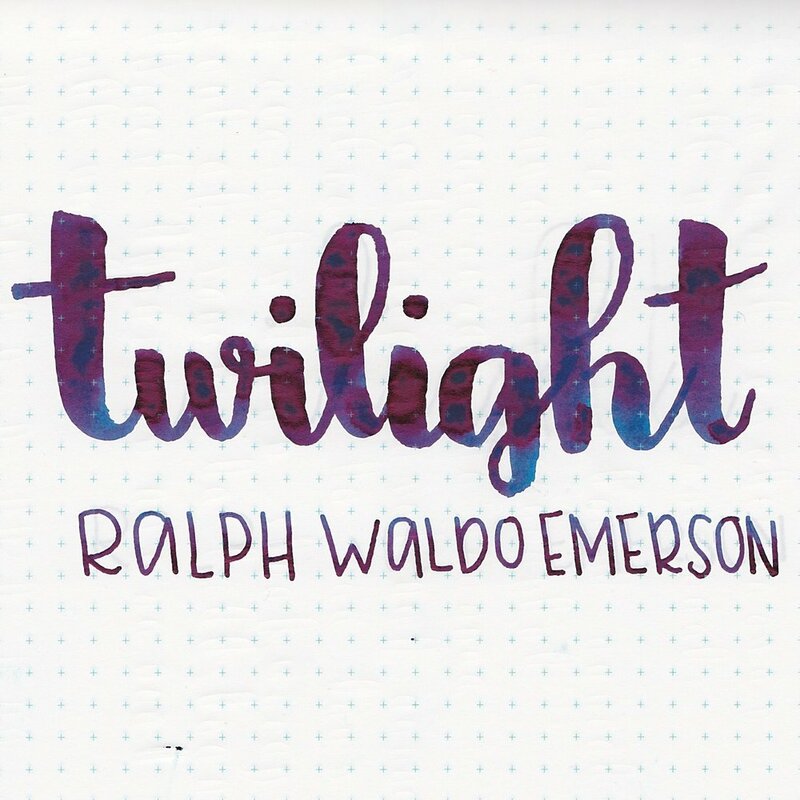 The new ink's full name is Ralph Waldo Emerson Twilight Blue, but I'm just gonna call it Emerson. It belongs to the Masters of Writing collection. I purchased my bottle of ink from Pen Chalet. The 55ml ink bottles are made in small batches of 50 in Maryland. Emerson is blue-at least I think there's some blue somewhere under all that sheen. Emerson is definitely another sheen monster. The ink drops look more like circles of pink foil rather than blue ink drops. This ink is similar to Organics Studio Walden and Nitrogen in that it gets everywhere. I filled the pens I needed, and tried to wash the ink off my hands, but even after washing them twice, I was still smearing ink on whatever I touched. So in the writing samples you will see some ink smudges, just from the ink left on my hands. Let's look at how Emerson behaves on good paper first. I expected worse on the Moleskine paper. I thought it would feather everywhere, but it actually did really well, with no feathering, but there was quite a bit of bleeding. This paper shows off the actual color of the ink itself, not the sheen-it's a nice dark blue. Ink swabs for comparison, left to right (top to bottom for RSS): Organics Studio Nitrogen, Organics Studio Emerson, and Organics Studio Walden. 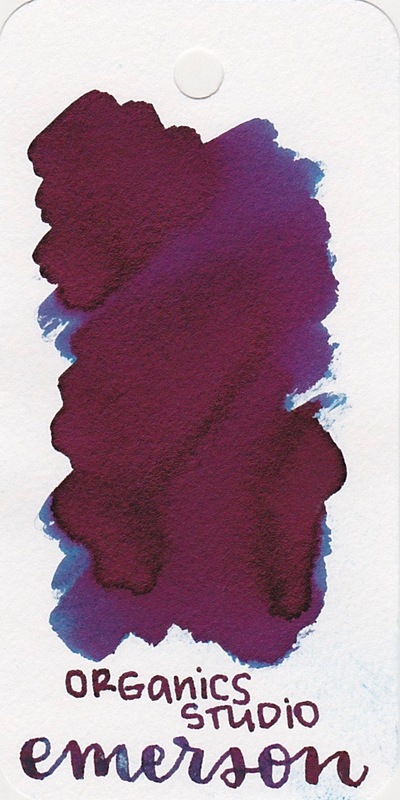 Click here to see the Organics Studio inks together. All three of these are Organics Studio's monster sheeners, and I don't think sheenier inks exist. Emerson is a little bit darker than Nitrogen, and more blue than Walden. Diamine Majestic Blue, Diamine Sargasso Sea, and Akkerman #5 Shocking Blue. All three of these are lighter than Emerson, and have a lot less sheen. Click here to see the blue inks together. I used a Pilot 912 FA on Tomoe River paper. Emerson ink and the Pilot 912 FA pen are a match made in heaven. Smooth, great flex, amazing sheen. Sometimes it's hard to catch the sheen in just the right light so you can see it, but it's pretty much pure sheen. The one downside to Emerson ink on Tomoe River paper is that even a day after it dries, you can still smear it. I tried to smear the s in "sacks," and just by running my finger across the page it smeared. I haven't noticed this problem on any other paper except Tomoe River. Con's: Some smearing on Tomoe River paper, sometimes you can't see the underlying blue under all of the sheen, it stains anything it touches, and it's a bit hard to clean every drop of ink out of pens. For me, I love playing with this ink-it's fun and interesting, and I'm glad I have a full bottle to play with. However, it is a "playing" ink for me, and not an everyday functional ink. I wouldn't write my school notes in this, but I still enjoy the ink.